I like pub food. I am usually a healthy eater, but there's nothing wrong with some periodic pub grub. I don't always feel like calculating how many calories I've ingested or how many Omega-3s per gram are in my sandwich. Maybe I just want to basket of thick-cut and seasoned wedge fries, to go Jackson Pollack with the condiments, and let my taste buds swim in a sea of Sriracha, ketchup, mustard, and starchy bliss. Don't you judge me. You're likely thinking about cleaning the bones of some sweet hot wings and licking your fingers clean. This was my mindset after about 3 hours of capoeira on Saturday. I yearned to counter all that shirt-drenching cardio and series of inversions with some wings and fries and beer. It takes some serious effort to maintain my "was-probably-a-body-builder-but-let-himself-go-but-still-does-pushups-every-other-day-and-thinks-that-helps" physique. The thick and juicy Toasted Bear Burger and fries. The perfect place in town for pub food after my workout is Toasted Bear Tavern in the South Wedge, on the corner of Gregory Street and South Avenue. I'd been there only two times since its transition from Beale Street Café, but noted that it had a similar aura as the previous establishment. The clientele was still a decent mix of in-town regulars and expatriate college or grad students, enjoying pool or darts or just hanging out, and Purple Haze is still on tap. I was beset with a sense of nostalgia when sitting down at a table at Toasted Bear. Some of the tables still have the "Beale Street" logo plastered on them under a centimeter of resin. No shade, to them, though. That stuff is hard to get off, and it's more environmentally-friendly to not sand down and re-lacquer a room full of otherwise perfectly good tables. 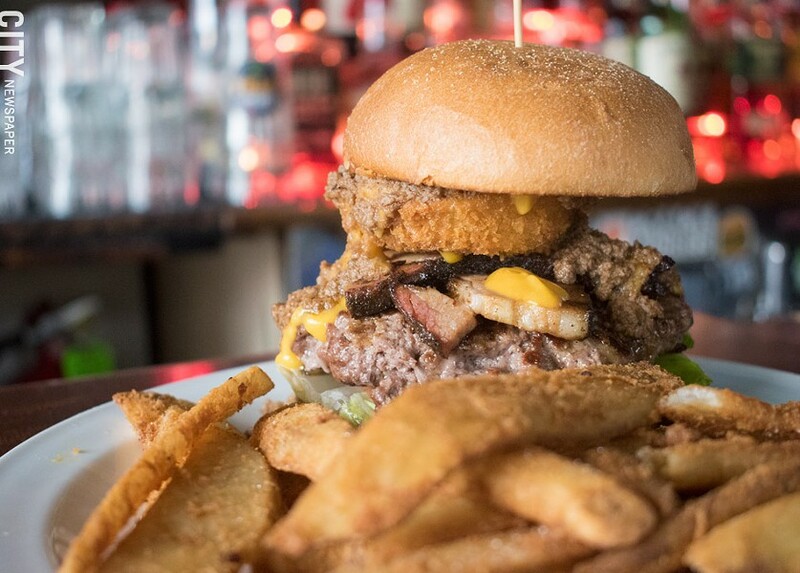 I craved greasy pub fare the first time I visited Toasted Bear Tavern back then, too. Expecting a small menu I planned on getting wings and fries, but my plans were thwarted by the robust menu. There were appetizers and sides and flatbread pizzas and burgers and six different styles of wings. They even offered soups and salads, and not just lettuce, tomato, and onion salads drowned in ranch, either. Also, since it was Friday, they offered a fish fry, which I ordered. The chef at the time came out and asked, "How would you like a broiled cod instead?" I was up for it, and he brought out a huge filet of light, flaky cod in a light white wine sauce and a side of roasted vegetables. Unless I'm in a British pub, I expect my fish fry to be a big slab of hurried, battered rubber with a side of lightly-fried bland potatoes. Toasted Bear gave me a gourmet meal. So much for greasy wings and fries that time. This time would be different. This time was not different. I had every intention of ordering wings and fries, and I did get the pub fries. They are everything I want in a pub fry: huge wedges, lightly seasoned, and the perfect ketchup-Sriracha-malt vinegar mouth delivery mechanism. The menu is still varied, with one major difference: There is a "Kitchen Verde" section. Toasted Bear Tavern co-owner Jesse Esan worked with the meal-delivery service Kitchen Verde to provide vegan choices for pub customers. Kitchen Verde owner Sarah Goodenough created the recipes for the menu items herself. 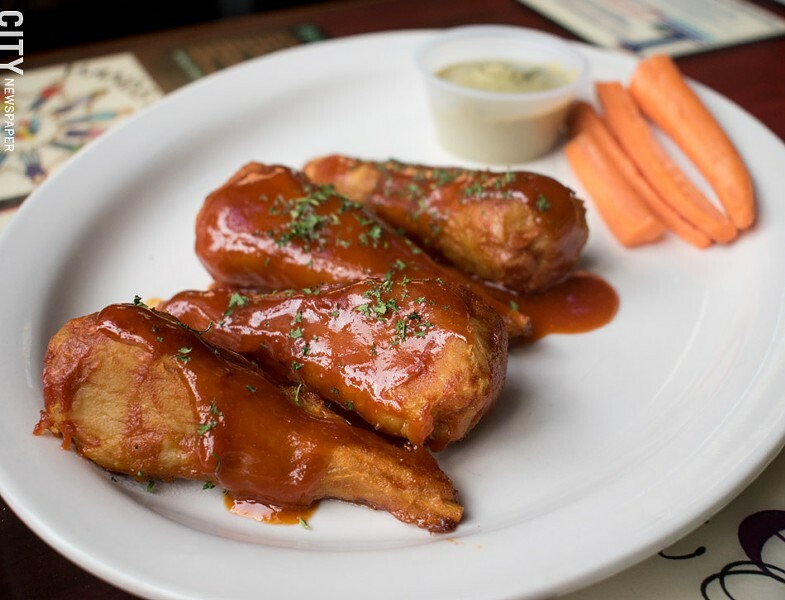 Now you can order roasted eggplant meatballs, Buffalo Chick'n mac & cheese, Chick'n wings, or chili-sans-carne ($12 for each item on the vegan menu). 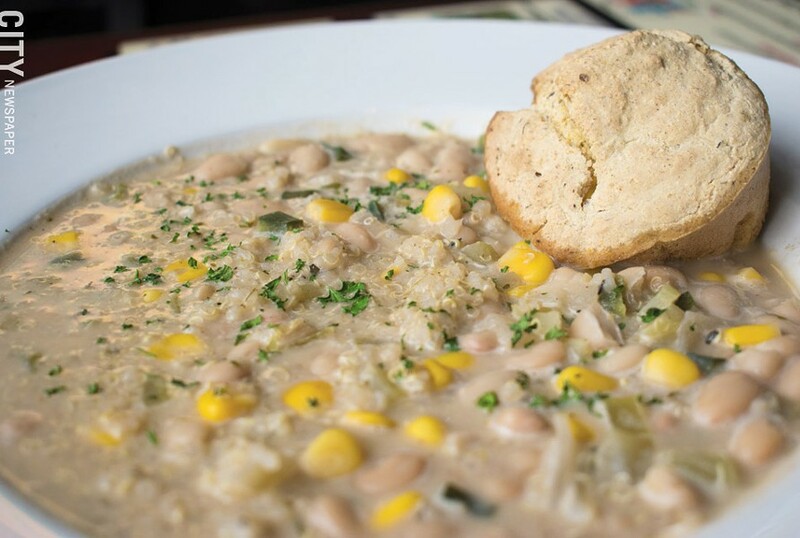 Andrew Alvarado -- the bartender who took my order -- told me that Goodenough rotates the recipes periodically, and that this week's chili-sans-carne is a quinoa and white bean chili with a side of corn bread. This all sounded delicious, but I had already had those fries, and I was determined to get some nice hot wings. There is no way I would be deterred! Vegan Chick'n wings, offered courtesy of Kitchen Verde at Toasted Bear Tavern. I was deterred. I ordered the chili-sans-carne. Delicious as it was, it could have used a little bit more spice. But take that criticism with a grain of salt; I inhale habanero sauce like it's oxygen, and I consider Sriracha to be as mild as ketchup. My colleagues stuck to their guns and had burgers and sandwiches. They said that the Toasted Bear Burger ($14) is thick and juicy, and well worth its price, and the Mediterranean chicken Sandwich ($11) is bold in flavor and still tender. One day, I will go to Toasted bear and try the wings. I will devour 10 of them in minutes. I will dip my fries in the remaining wing sauce, and I wash it down with a Purple Haze, and my craving for pub fare will be satisfied. That time will be the next time I go to Toasted bear. I promise this. UPDATE: I got the eggplant meatballs.